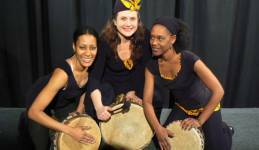 Our all female in house drumming group. This act incorporates drumming, singing and dance and lots of inter-action from the audience. Performances can be adapted for children. Drumming workshops available on request.